The next night (3/1/2016) he went on the radio show Dr. J Radio Live and claimed that John A. Gotti was writing online under my account– which would never happen since to my knowledge John A. Gotti never even goes on social media (and he does not have my passwords)– and even said that Gotti ordered me to call and text his daughter in addition to numerous other lies which he presented no proof of, even that I contacted and harassed the niece of another radio host, Jeff Lowman, who says she is 15– a minor. Why are these lies equally or more egregious than any of John Alite’s others? 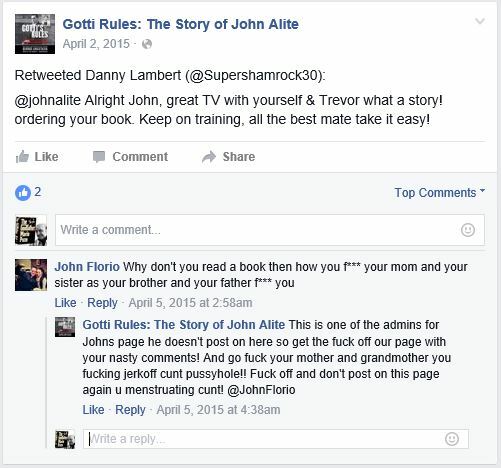 1- Because after John Alite started lying publicly in early 2015 that John A. Gotti and his family were threatening him and his children, especially without providing proof (because it never happened and there isn’t any), he was warned that the only way to truly defeat these allegations would involve revealing how John Alite has treated his own children over the years through the release of all kinds of documents and files including phone recordings made of Alite discussing his views on his children from prison. Alite was told that no one wanted to do this and that John A. Gotti, even when he was facing a life sentence for crimes he did not do in 2009 based on John Alite’s lies, when cross-examining John Alite he still would not permit his attorneys to release certain damaging evidence against Alite as he knew it would indirectly harm Alite’s children by making them look at their father differently as it would have revealed what he really thought about them and made him the subject of public ridicule. Something that is even more true if the materials were to be released today as it would cause his audience to turn on him like no other material could. John Alite was asked before and is being asked again to tell the truth, retract his statements, to stop saying that people were threatening him and his children when they weren’t and to just go away, quietly, for the sake of his children if nothing else as NO ONE wants to release these files and recordings. However: If John Alite does not recant it will just reinforce the belief that he does not care about the well being of his children. 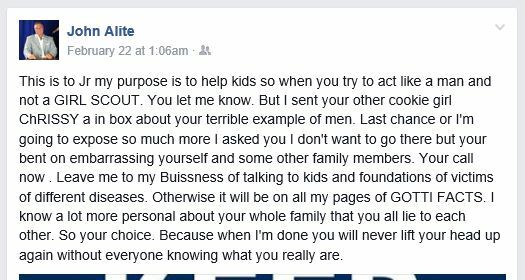 2- After his book’s publication when I began challenging John Alite’s lies in February, 2015 I was challenged multiple times by his children, and, even though it seemed they had knowledge of his fraud but were still supporting it I always went out of my way to be respectful to them as I know it is not their fault that they have John Alite for a father (which has to be a tremendous weight on their shoulders). In addition: I even discouraged others from bashing his family and children. The following is one example. 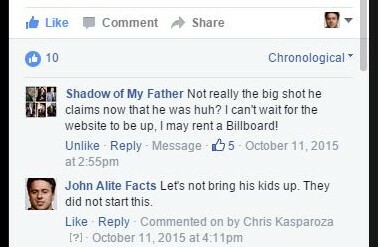 From Facebook.com/JohnAliteFacts, notice how the comment regarding his kids before my response was deleted? While I did not delete it myself, which would have been censoring the discussion, after I expressed my opinions to the commentator that it was not classy to insult Alite’s children– which John Alite never does when people comment on his threads and insult Mr. Gotti’s wife, mother, siblings and children– the poster went ahead and deleted it himself. 3- While I did have a recent interaction with John Alite’s daughter, Chelsea Alite, which I believe is what he was referring to I did not “contact” her. 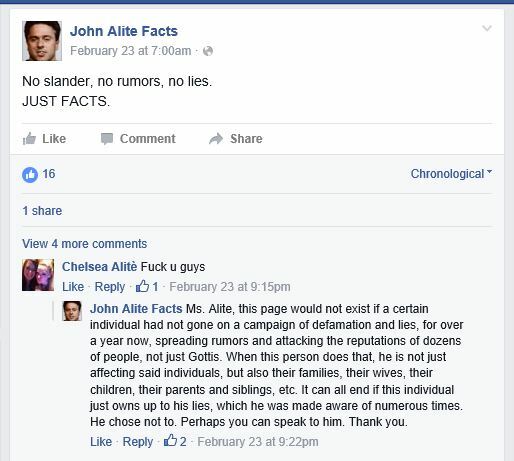 After the launch of JohnAliteFacts.com on February 18th I ‘followed’ over 1,000 people who were following John Alite from the JAF Facebook, Twitter and Instagram accounts but only to alert them of the website and if one of these people was a member of Alite’s family I was unaware and I apologize as it was only by accident. But: I only ‘followed’ them, I did not message them. Except: for a handful of those people out of over 1,000 because either they messaged me first, or, I believed they were in business with John Alite and wanted to let them know he is a fraud. No slander, no rumors, no lies. 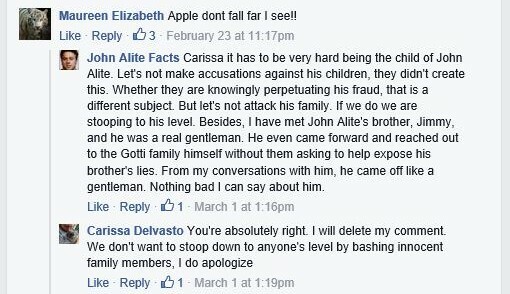 Unless Ms. Alite was one of the many people who have messaged me/commented under fake accounts trashing myself and the website, and except for a short exchange we had in February, 2015 when I challenged some of the lies in his book on John Alite’s Facebook page and she jumped in to defend him, after which I spoke to her with all due respect, I have had no other contact with her. And if there was I would have been arrested under U.S. Code § 1512 – Tampering with a witness, victim, or an informant which states that I could get 20 years just for threatening a protected witness like John Alite. So, imagine if the judge found out I was threatening John Alite’s daughter? 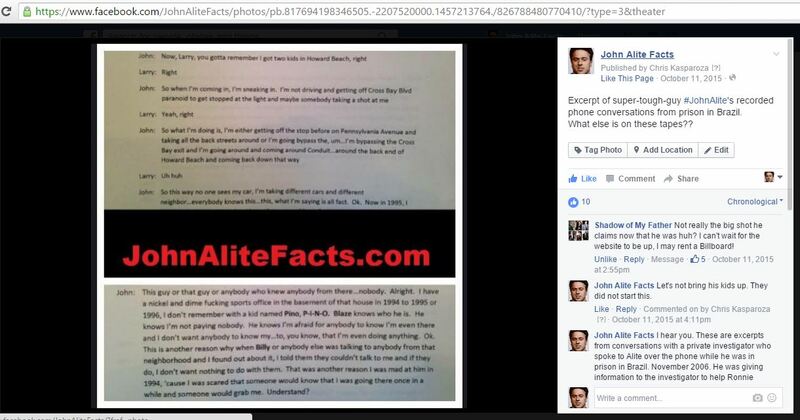 4- What I find the craziest about Alite’s comments above– that Mr. Gotti and myself were threatening and trying to “intimidate” his daughter? The same guy who lies that John A. Gotti hides behind his mother and sisters sent messages himself through a woman, threatening to slander and degrade John A. Gotti’s wife and sister? NOTE: I also have reason to believe that it was not even Alite’s daughter who made that comment on the Facebook page, but instead, Alite himself under her account and without her knowledge. To protect her privacy I can not reveal why I have reason to believe that, but, unless she comes forward and says that it was actually her I have to wonder if it was really her father, hiding under his daughter’s account, and that he may have left that comment hoping I would react with vile language/disrespect that he could then use to blast all over the internet in his effort to discredit me. Like the whole thing was a set up, a trap he tried to catch me in, firing shots through his daughter with her as his shield. All I know for certain is that this is what John Alite does. 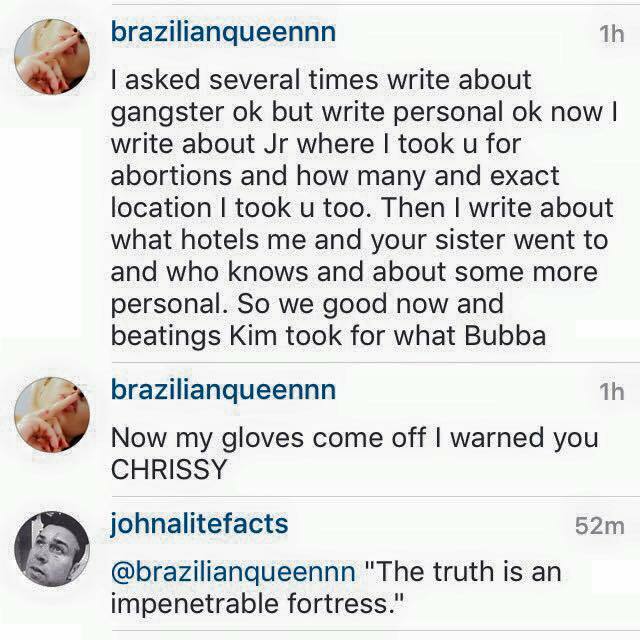 John Alite distorts the facts. He lies, he slanders people. If he has an adversary that he can’t bully into silence he’ll try to discredit them by telling outrageous fairy tales about them. For example, if you tell John Alite he’s a liar in a Facebook message he’ll go on a radio station and lie to the world that you were convicted of perjury. Things like that. He also leaves out that he was sued for child support in Brazil in 2006 over little Guilherme who was born there in 2005. Why did he leave that out of his book? And why is it that when he lies that people were threatening his daughter and abusing their wives he leaves out that he testified in two trials, under oath, that he himself threatened and assaulted multiple women, including his ex-wife? 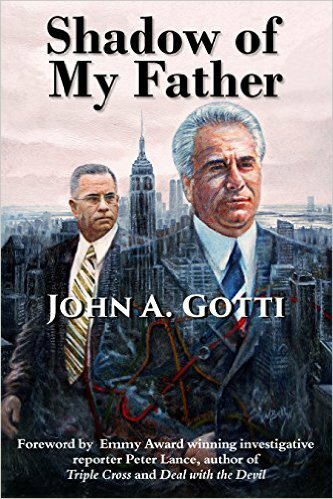 John Alite has provided no proof and can not provide proof that either myself or Mr. Gotti ever called, texted, messaged, threatened or tried to “intimidate” his children, especially his daughter, so therefore, it did not happen. Chris, can you email me at cosanostranews.com…. need to talk to you.you don’t need to publish as a comment unless you want to….. Very clever… using my name…. I’ve got to tip my hat to you on that one. 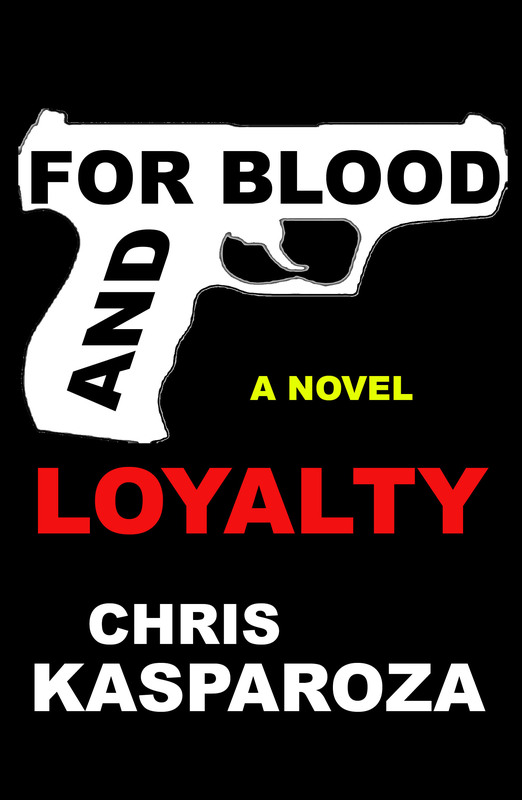 Hi Bryan, her name was only mentioned– never before and never after– only in this topic because John Alite broached this topic first, going on radio shows and the internet saying people were threatening/intimidating her. No one wanted to mention her name and I hope I never have to again, out of respect, and also because I know none of this is her fault… but perhaps she can talk to her father and get him to stop with his lies and attacks. I wish both you and her well.